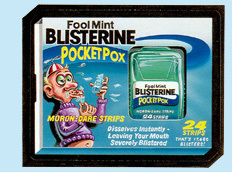 Note: "Blisterine Strips" was artist George Wright's first published Wacky Packages work for Topps. 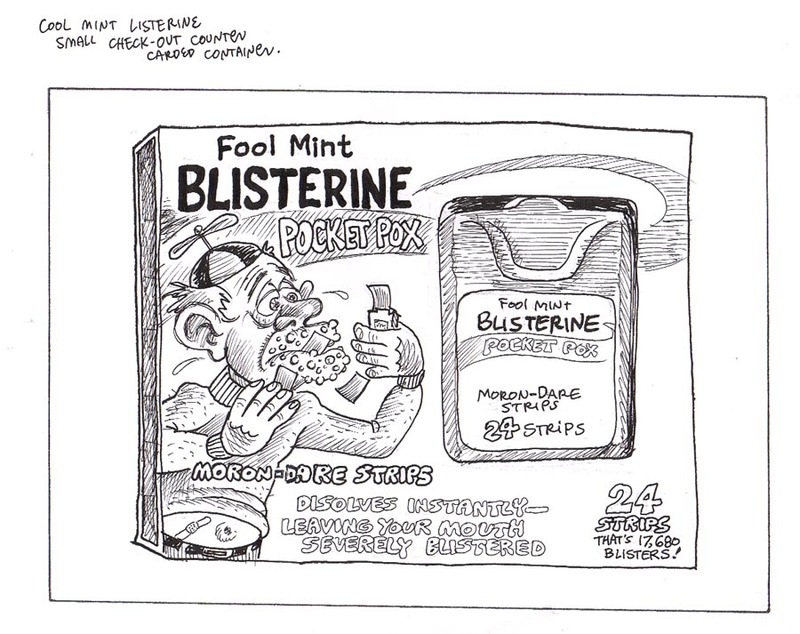 Jay Lynch drew the rough of his Listerine Oral Care Strips parody as a candidate for ANS1, but the idea was not developed into a final painting during the production of that series. When a "Blisterine Strips" painting was commissioned for ANS2, artist George Wright followed Lynch's blueprint closely, carrying over his gags verbatim. Wright remained faithful to the spirit of Lynch's moron character but translated it to his own style. Wright started by laying out the packaging in pencil on letter-size copy paper. He prefers to develop his characters on separate sheets, because he tends to change that element of his pieces the most. When Wright was satisfied with the character, he scanned it and positioned it within the "Blisterine" box. Wright next transferred the final pencil drawing to a piece of hot press illustration board. He rubbed the back of the paper with a pencil, positioned the rough on the illustration board, then traced over the original so that it left a ghost image on the board as a template for the painting stage. A scan of an interim stage of Wright's painting (left) shows the character completed, with some differences from the sketched version: his lips are more pursed, with a strip applied where his mouth line had been; and his exposed belly is missing the band-aid that was evident in Lynch's rough and Wright's pencil drawings. The Topps Vault sold the finished art for "Blisterine Strips" for $2,603.53 in an eBay auction which ran from January 19-26, 2006. "Mackerel," a parody of Marvel Comics' home page, is found on the back of "Blisterine Strips." This card's "Spineless-Man" was the first of two Spider-Man spoofs associated with ANS2; the "Spitter-Man" promo card was the second. An earlier Wacky Packages title named "Blisterine," a spoof of Listerine mouthwash, appeared in 1974's 6th series.